Earlier this month, a dead whale was found in the Philippines with 88 pounds of plastic in its stomach which included 16 rice sacks — similar to potato sacks — and plastic bags from local Philippine grocery chains. Plastic pollution in marine life is not just a problem in the oceans but lakes and rivers as well. 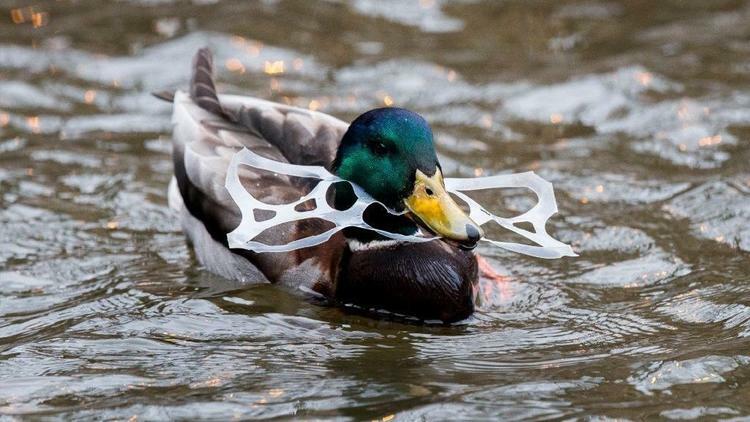 Recently in Chicago, a group of local residents was trying to help a duck with a six-pack ring stuck around his neck. While plastic pollution is harmful to animals, it is also a serious problem for U.S. cities where recyclable plastic is now being sent to landfill or being burned due to the country’s recycling crisis. There’s now a new R in the Reduce, Reduce, Recycle phrase and it’s REFUSE. This is one of the easiest ways to reduce plastic waste. Refuse plastic straws at restaurants. Refuse disposable utensils when getting takeout. Refuse plastic kiddie cups with plastic lids if your children are old enough to drink out of glass. Refuse plastic bags at stores and restaurants. Reusable lunch containers. Bringing your lunch to work is an easy way to reduce waste and it’s good for the waistline as well. Whether it’s dinner leftovers, a sandwich or salad, reusable lunch containers are the first step to a waste-free lunch. Reusable sandwich/chip bags. There is no need for individual baggies with reusable bags that are perfect for sandwiches, chips and other snacks. This bag has an EcoTwill exterior that is made from a blend of recycled PET bottles and organic cotton. Machine washable so it can be used over and over. Reusable utensils. When packing a meal for work or outdoor dining, add utensils from home in your bag. Another option is to invest in a portable utensil set that can be kept in the car, a bag or desk drawer. Reusable straws. Many municipalities are enacting plastic straw bans and bars and restaurants are voluntarily eliminating straws. Reusable silicone or stainless steel straws are great to keep at home, in the car or in a purse so its always handy. Reusable grocery and shopping bags. The bulk of what was in the dead whale’s stomach was plastic bags. Having a stash of reusable bags will make sure you can always refuse plastic. Make bags readily available but keeping sets at home, in cars and in a purse/briefcase. Reusable water bottles. Disposable water bottles are hugely wasteful. Buy a reusable water for everyone in the family so there is no need for single-use water bottles. Reusable coffee mugs and tumblers. In 2011 it was estimated that 2.5 billion coffee cups were thrown away each year and that figure is likely to be higher now. Do your part to reduce and invest in a travel tumbler. A bonus is that many coffee shops will give you a discount for bringing your own mug. Reusable vegetable and produce bags. There’s nothing wrong with putting apples loose in your grocery cart or in your bag at an outdoor market. But if you prefer bags, invest in reusable produce bags. Some even claim to keep your produce fresh longer. If you forget to refuse, use the bags for pet waste disposal. Many animal shelters will even take donations! Small changes can make a huge difference in reducing waste. Once you start, you’ll continually want to do more to protect our Earth.